For the second Test running, Mahela Jayawardene and Thilan Samaraweera batted with a purity of purpose, which New Zealand have been unable to produce all tour, to help the hosts share the first day's honours. The truncated first session was shared by both sides, the second saw Kumar Sangakkara try and dominate with a sweep-fuelled 50 before he became Daniel Vettori's 300th Test victim, and in the third Sri Lanka fully assumed control as Jayawardene and Samaraweera put together an unspectacular alliance of 147 that chipped away at New Zealand's spirits. A sparse crowd at the SSC witnessed a slow-paced, gritty battle between bat and ball leading into tea. Neither Sri Lanka nor New Zealand really took control on a slow surface and under constantly threatening clouds, but the final session solidified the hosts' position. In the first session Sri Lanka scored 62 and lost one wicket; in the second they made 83 and lost two; between tea and stumps they scored 116 without loss. New Zealand are still one wicket away from an inexperienced lower middle order but need something spectacular tomorrow because conventional wisdom says that day two is best for batting at this venue. Jayawardene batted as if he expected to score another century at the SSC. It was a typical effort, full of careful leaves and textbook pushes to the off side played with perpendicular front elbow and resourceful tucks off his pads. No frills, just obstinate, indomitable, remorseless batting. By the time Samaraweera walked out, Jayawardene had eased himself in; all he needed was someone to reciprocate. They blocked their way through the start of their association with hardly a shot in anger. Yet as he settled in, Samaraweera began to use his feet well and looked to score off Jeetan Patel. 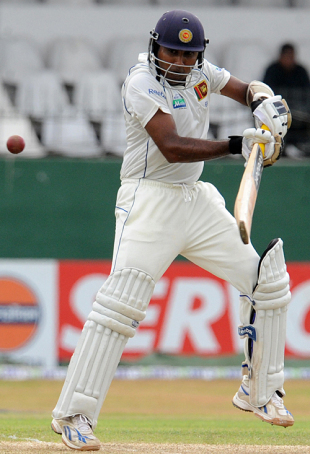 Jayawardene waved the bat in acknowledgement of his half-century and then prepared for his 118th delivery. The pair stepped up a gear as they built on their platform. Samaraweera twice hammered Patel for fours and Jayawardene paddled Jacob Oram to fine leg and then played a pearling drive on the up off the same bowler. Samaraweera raised his half-century in a Jesser Ryder over in which he clipped, drove and edged 13 runs. Sri Lanka meandered along at a leisurely pace. In the last session, with the sun out and a pleasing breeze blowing, batting was easy. Vettori used pace and spin at the same time and later brought himself on with the new ball, but a flat pitch and twinkle-toed batting from Jayawardene and Samaraweera ensured the ball was worked all across the field. Vettori operated with a slip and short leg with spin, for the most part, but put only one man out for the seamers. He could perhaps have been more productive with an inside-out field when the clouds passed over in the afternoon. Overall, batting together in Tests, Jayawardene and Samaraweera have scored 2132 runs. Once again Vettori was New Zealand's best bowler, maintaining a consistent line and length to take 2 for 65 in his 30 overs. There wasn't much bite in the track, which offered slow spin, and Vettori had to rely on flight and variation to test the batsmen. He was not given much support, though, by his spinner partner Patel, who the batsmen were able to drive off both front and back foot with ease. Patel rarely threatened as he was a bit flat and frequently dropped short. Oram once more failed to make a mark. Earlier in the day, both teams had fought for a truncated first session's honour, which was evenly shared. In their first spells, Chris Martin and Iain O'Brien operated on two lengths, back of a length and full outside off stump, to keep the openers quiet. Martin was making the ball move late and O'Brien repeatedly tried to extract lift from the surface. It set the tone for Vettori. Either side of the lunch interval, Vettori bowled 17 unchanged overs with a slip and short leg throughout. In that spell, he took the two wickets needed to reach 300. Vettori's introduction in the 11th over, from around the stumps, was welcomed by an announcement over the PA system that he was two short of 300 wickets. Wicket No. 299 came immediately, when Vettori drifted his second delivery away from a bemused Tharanga Paranativana, who edged to slip for 19. Tillakaratne Dilshan and Sangakkara took a few chances against Vettori, frequently trying to get under his skin by sweeping, and denied him the landmark wicket going into lunch. Dilshan fell early in the session, popping a leading edge back to O'Brien. Sangakkara had a plan against Vettori, perhaps because he'd heard him say how sweeping unsettled him the most. He swept two of his first five deliveries from Vettori for four and showed a preference to get on the front foot, looking to drive anything on the fuller side. Most of Sangakkara's innings was against Vettori's bowling: 65 of his 96 deliveries in fact. There was a man at deep midwicket and long leg yet Sangakkara went for his sweeps. He stepped out twice to club Vettori over mid-on for four, but fell to a slog-sweep to Oram in the deep for 50. With that, Vettori became the first left-arm spinner to take 300 wickets. He raised his arms and allowed himself a smile, nothing fancy. From there on the lack of support told. It is the story of Vettori's career.